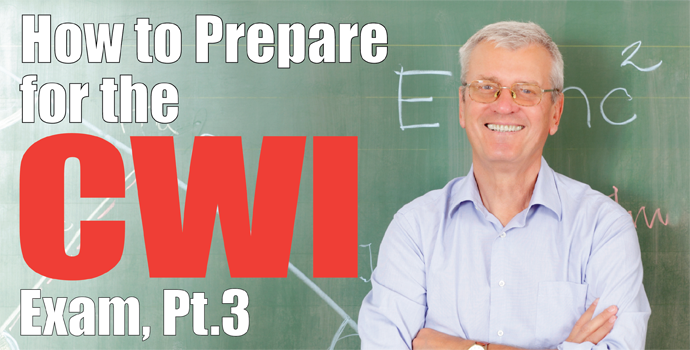 In Part 2 of our in-depth look at how to prepare for the CWI exam, we discussed how to get a realistic idea about how many of the CWI exam knowledge points you already know. We also talked about how much time and effort will be necessary to learn about the topics you are not familiar with. In this final part of our blog series, we’ll focus on how to get the most out of the CWI test prep resources that AWS provides, and review some study tips that can help you prepare for the exam! The majority of CWI test takers, especially first-timers, opt to take a CWI seminar leading up to their CWI exam. They certainly aren’t compulsory, but the benefits of attending one are substantial. A CWI Seminar can be viewed as the final stretch of the marathon, right before you take your exam and cross the finish line. CWI seminars are usually 5-day affairs. They feature a Part C code clinic for those testing to D1.1 or API 1104, a review of Welding Inspection Technology, and a Visual Inspection Workshop for Part B. Because of the wide range of topics covered and the challenging nature of the exam, it should be clear that a week-long, 40-hour seminar isn’t going to suddenly change all those 1’s and 2’s on your self-assessment into 2’s and 3’s (See Part 2). However, it should reaffirm the topics you’ve learned, clarify any areas you may have found murky, and give you the strongest sense of what you can expect on the exam. In other words, you cannot simply rely on the CWI seminar to provide you with the bulk of the instruction you’ll need for the exam. For example, the live CWI seminar covers welding symbols in a one to two-hour block. There is no way to cover the entire A2.4 Standard Symbols for Welding, Brazing, and Nondestructive Examination in two hours. However, if you’ve prepared ahead of time, this portion of the seminar serves as a valuable review for the exam. Additionally, seminars are taught by AWS adjunct instructors, so you’ll have the opportunity to ask questions, as well as interact with other CWI hopefuls. We’ve mentioned the advantages of taking the live CWI Seminar, but what about the CWI Pre-Seminar? The CWI Pre-Seminar is a series of online courses, totaling 57-hours of content, designed to prepare you for the Fundamentals (Part A) portion of the CWI exam. Unlike a live seminar, which is scheduled at a specific time and place, the pre-seminar is an e-learning resource that allows you to learn the material at your own pace from any device with an internet connection. It is ideal for helping you learn many of the CWI exam topics identified in Table 1 of the AWS B5.1 Specification for the Qualification of Welding Inspectors. It is also an excellent precursor to the live CWI Seminar because it covers many of the topics you are expected to know going in. For example, the online Understanding Welding Symbols course will put you in the best position to take advantage of the two-hour review during the live CWI Seminar. The CWI Pre-Seminar also includes the following courses: Welding Fundamentals, Safety in Welding, Fabrication Math, Metallurgy for the Non-Metallurgist, and the Science of Non Destructive Testing. Many potential test takers find the entire exam process to be an intimidating or stressful one. But it really doesn’t have to be. With a bit of discipline, drive, and adequate time to prepare, you can properly assess and overcome the challenges of the CWI exam. Finally, I leave you with a short list of do’s and don’ts that may help on exam day! Do – Make a small mark on your answer sheet next to each answer you are skipping or are unsure of. This makes it easier (and quicker!) to return to those once you’ve gone through the test. Don’t – Rely solely on tabbing and the table of contents for the codebook portion of the exam. Tabbing can be helpful but, if everything is tabbed than nothing is tabbed. There simply isn’t enough time to continually refer to tabs or the table of contents to locate information. For example, if you encounter a question on the API 1104 codebook on Liquid Penetrant testing, you should immediately know to jump to Section 11 for Procedures for Non-Destructive Testing. Do – Make sure you’re familiar with the tools needed for Part B of the exam. You may have all the knowledge necessary to do well on the practical portion of the exam, but you don’t want to waste valuable time getting used to how to use the tools that are presented to you on test day. Many of those who take the exam aren’t necessarily involved in inspection on a daily basis, so the use of these tools isn’t always second nature. Don’t – Leave any questions blank! An unanswered question counts as a wrong answer. 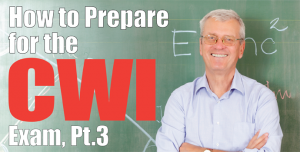 I hope this three-part series has shed light on how best to prepare for the CWI exam. Please let us know in the comments if you have any questions, or if you have an idea for other topics you’d like us to cover in a future blog posting! Muy buen instructivo ! Excelentes temas .